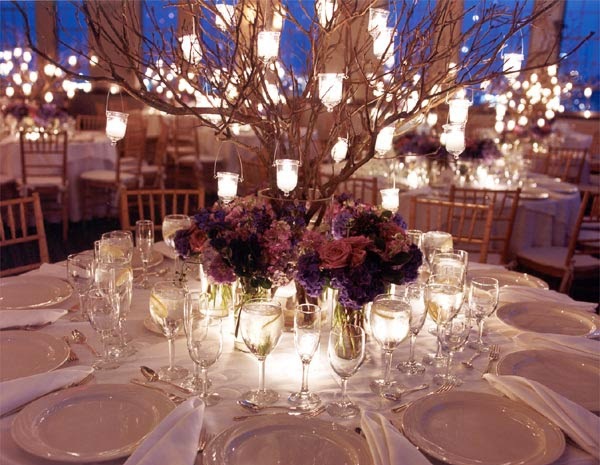 One of the best ways to decorate a wedding reception is to use centerpieces to enhance the look of the party tables. 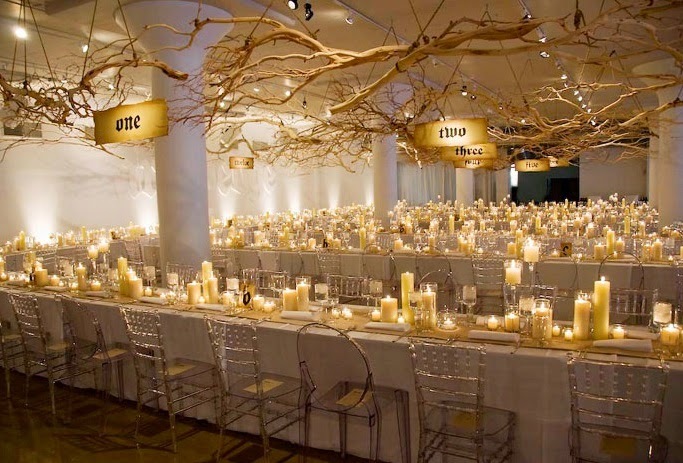 If you are looking for wonderful ideas to decorate your wedding tables, candles are among the most beautiful options that you may like consider. Candles come in many different shapes, colors, and sizes. They can be used in various ways to create beautiful table centerpieces. To name some, here are a few ideas that you can follow. Combined flowers and candles and you can create an eye-catching centerpiece on your table. Using a clear glass bowl, you can easily assemble some flowers and floating candles to make a great centerpiece. Choose flowers and candles in pastel colors if you are planning a spring or summer wedding, or deep toned colors if they are for your fall wedding. You can use a large silk floral bloom to create a focal view while surrounded by smaller fresh flower blooms and floral-shaped floating candles. The entire table can then be sprinkled with some flower petals to keep the floral theme on the the table setting. Floating fruit-like candles are also great ideas to add touches on your wedding party tables. You can play with different colors like yellows, oranges, reds, greens, and pinks that you can see in real fruits. There are plenty of fruit-like floating candles, designed to create an exquisite detail on counter tops, desktops, and of course party tables. You can simply put them in a clear glass bowl with enough amount of water and make them float! This also makes a great focal point for spring and summer wedding receptions that infuses delightful scents without slicing any fruit. This often works especially during brunch receptions or luncheons. More magical ideas can be created with the use of floating candles! Another wonderful option could be floating candles in a shape of butterfly. Floating butterfly-shaped candles are truly a mesmerizing centerpieces that sure to impress your guests. Making this centerpiece can be as simple as putting the candles in a clear glass bowl and just let them float. Feel free to add extra touches like sprinkling a few orchid petals on the surroundings of floating candles, or you can just have them scattered on the surface of the table. 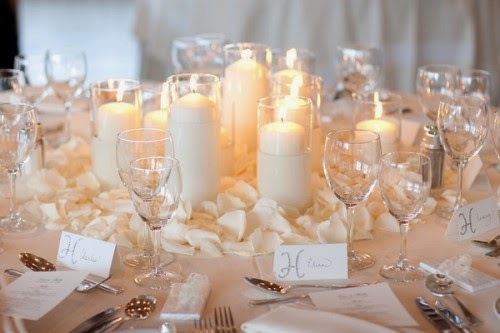 Another excellent usage for candles centerpieces is to use hourglass-shaped cylinders that are large enough to accommodate a large silk flower at the bottom and a nice pillar candle on the top, or the other way around. If you are looking for elegance, consider this centerpiece idea as it will never fail you. Get creative! You can fill the cylinder with just anything you want aside from candles and flowers. Other more options for wedding centerpieces can be found online. Decorating wedding tables are not only limited to using candles, there are other items you can use like flower arrangements, arranging wedding favors in a nice basket, and even using some dried stems where you can hang glittering charms and other cute wedding ornaments. 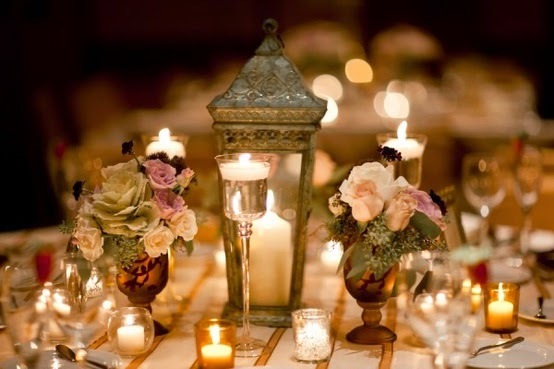 Candles are inalienable decorations while planning a wedding. This post is a good source to understand what to take into consideration while designing venue floor plans of your wedding. Using a wedding seating chart template can help you with do these kind of arrangements.